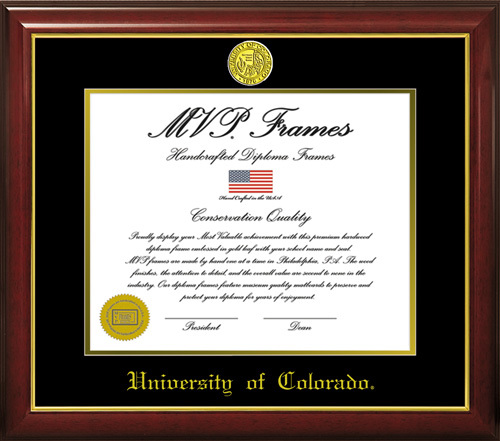 MVP Frames represents a new strategy in Collegiate diploma frame retailing. The reference letters on this website offer compelling proof of how this new strategy generates both increased frame volume/profits, and how it yields higher customer satisfaction for your store. All of our clients previously had diploma frame sales ranging from strong to heavily overstocked due to the economy, yet they all saw our $39.95 (8"x10" diploma) solid hardwood conservation quality frames could offer expanded price tiers to increase (or restore) their sales without trading dollars down. MVP Frames is a subsidiary of Varsity Athletic Apparel, Inc. (website link at the bottom of the page) which is the nation's largest collegiate supplier of framed varsity letter awards. The long term relationships that our parent company has framing varsity letter awards and certificates for hundreds of college athletic departments has given us an instant track record at the respective bookstores to whom we are now selling. Please review our diploma frame website. Our experienced sales staff is looking forward to hearing from you!